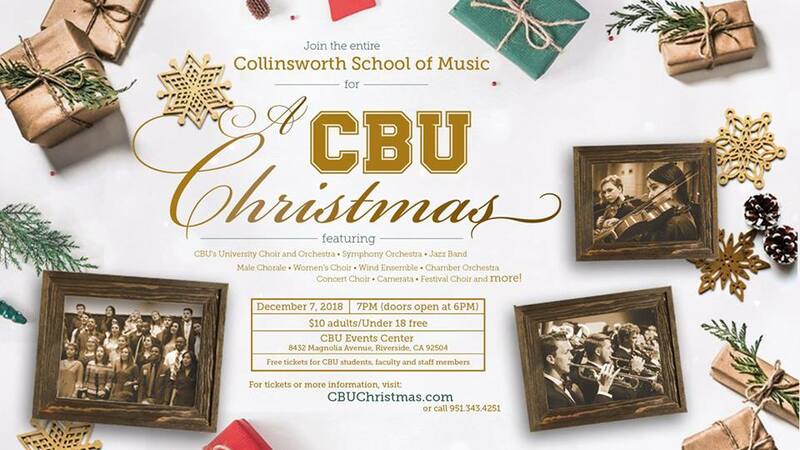 For the first time in California Baptist University history, the annual Christmas Concert will bring together groups from the Shelby and Ferne Collinsworth School of Music for an evening celebrating the holiday season in the Events Center. This event, “A CBU Christmas,” will be held Dec. 7 at 7 p.m. The University Choir and Orchestra, Male Chorale, Women’s Choir, Wind Ensemble, and Jazz Band will perform as one group. Dr. Joseph Bolin, dean of the School of Music, said the event was created to bring the Riverside and CBU community together to celebrate the Christmas season. “This inaugural concert will feature more than 300 students from 10 different School of Music ensembles performing an abundance of glorious Christmas music that will stir the hearts of old and young alike,” Bolin said. Mairin Deasy, senior communication studies major, said the audience should expect to participate in the performance along with the choir and orchestra, for the purpose of worshiping during this Christmas time. Deasy said there will also be different renditions of well- known Christmas hymns that the program will modernize for the performance. Traivon Williams, professor and director of Male Choral, said he hopes the CBU community does not miss this opportunity to listen to holiday music performed by the university’s musicians. “I have been a part of the Christmas programs at CBU for the past six years,” Williams said. “This one is really special to me because it is one of the only times the entire School of Music has joined together for an annual Christmas concert. Many faculty members expect the production to be a great kickoff to the Christmas season. Although these groups are performing on their own, there will be a point in the concert in which the audience will be singing along with the choir and playing together on a few songs. Admission is free for students, faculty and staff with a university ID card and for children 17 and under. Otherwise, admission is $10. Tickets can be purchased at the event center’s box office or online through the School of Music’s website at www.music.calbaptist.edu.